A common question for high school students or those looking to change careers to a medical field is how many years does it take to become a nurse? Its misleading and confusing reading nursing acronyms like CNA, LPN, RN, CRNA because you have no idea what they mean let along how long it takes to get that nursing designation. 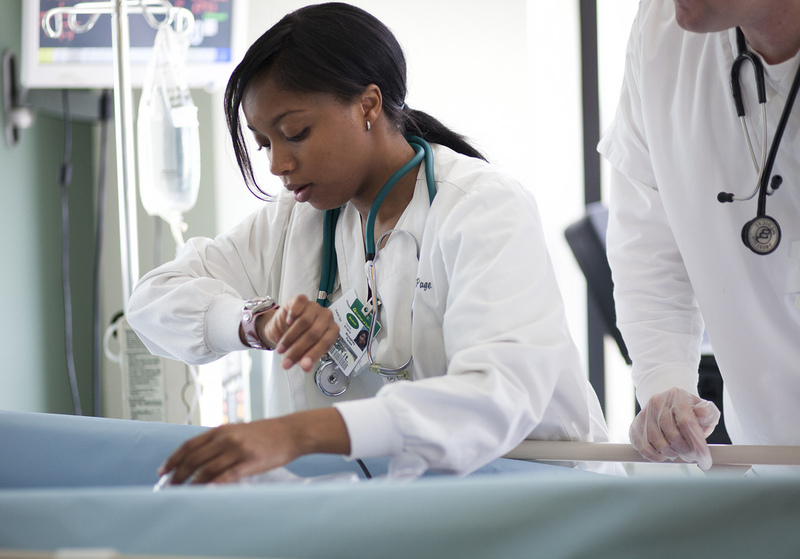 Under most circumstances, an undergraduate education as a nurse takes between 2 to 4 years. When we think of a nurse, we think of one who cares for his/her patients and can administer medicine to them. This is a registered nurse an RN; it is the standard. The standard college education for a registered nurse is two years in time. At that point, youll graduate with an associates degree in an applied science. Although two years is the minimum required to be an RN, there may be a semester or two added to the overall time because you have prerequisites for nursing school that need to be met. That said, total time to complete an associates degree in nursing may be closer to 2 to 3 years from start to finish. You have other options, too. Rather than getting an associates degree, you could opt to go to a school that offers bachelor degrees, which requires four years. The BSN track is probably the best option for high school students. The additional two years teach you management and leadership skills and provide a general education, rather than a vocational one. If you dont want to commit to a bachelor of science in nursing from the start, you dont have to. You could complete your associates degree, work for awhile and complete a registered nurse to bachelor of science in nursing degree also known as the RN-BSN track. If you are thinking two to four years is too long to become a RN, there are other options. If you are unsure if you want to be an RN, the best route for you would be to complete a certified nursing assistant program and complete the certification requirements of your state. It takes about 6 to 8 weeks to become a CNA, during which time you complete classroom and clinical training. You then need to meet an additional requirements of your state. But after you become a certified nursing assistant, you can work in a healthcare setting or nursing home and learn the ropes of patient care. Because patient care is a big part of nursing (no matter what designation or nurse you are CNA, LPN, RN, CRNA, etc.) youll know if you are on the right track. You may then want to consider moving into a LPN or RN program. Of the two, the RN program is the way to go. Nursing is a rewarding career. You educate and care for patients (and their families) along with work with physicians and other medical staff. An RN requires a desire to work with people and have compassion and patience. Other important skills include honing your critical thinking skills, which is a trait that makes a good nurse. For instance, if you are an Emergency Department RN, you may be responsible for three patients during your shift. The attention required for each patient will be different at any given time, and you will need to think and prioritize who needs care first. Example: One patient needs stitches and has been waiting 2 hours for the doctor to do them and is now complaining. Another patient just arrived with chest pain, pain in the left arm, and has shortness of breath. And the ED physician wants you to put an order in for a chest xray on your third patient who complains of a chronic cough. Sounds like a lot to manage? It is. But emotional stability and organizational skills, along with being detail orientated, will serve you well as an RN. Nursing contains many specialties. Theres pediatrics nursing, emergency nursing, geriatrics, scrub nurse, circulator nurse in the operating room, and so many more you can choose from once you pass your NCLEX and become licensed as an RN. Each has their perks and drawbacks. You learn them during your clinical studies as a hospital. You may also learn that there are advanced practice nursing specialties that interest you. A CRNA provides anesthesia and anesthesia-related care to patients throughout the entire surgical procedure. Although a CRNA requires a masters degree, which is an extra two years of school after a bachelors degree, it provides advanced practice capabilities and an environment that interests me. Advanced practice in nursing does take about 6 years total from start to finish, but it can prepare you for higher paying, higher responsibility jobs such as being a CRNA or a nurse practitioner. I hope this has answered the question how many years does it take to become a nurse?